While traveling on work today in North Carolina, I had an unexpected treat: the chance to hear Bach on a beautiful historic tracker organ that had been restored by some dear friends. Tracker organs are built the same today as they have been for hundreds of years. I came to love tracker action organs while living in the Shenandoah Valley and becoming friends with George Taylor and John Boody. George and John are the founders and principals of the world-renown Taylor & Boody Organbuilders located just outside Staunton, Virginia. These two men and a small group of craftsmen build and restore some of the most beautiful organs in the world. And so it was a great treat to visit Old Salem today in North Carolina and see the historic David Tannenberg organ from 1800 which George and John restored as part of a fifteen-year project. Dr. Janette Fishell, the Professor of Organ at the Jacobs School of Music , Indiana University, was in town for a concert tomorrow and played a movement of the Bach Concerto in G Major, BWV 592, for our group. It is always wonderful to hear Bach played on an organ that – were he alive – he would find very familiar. 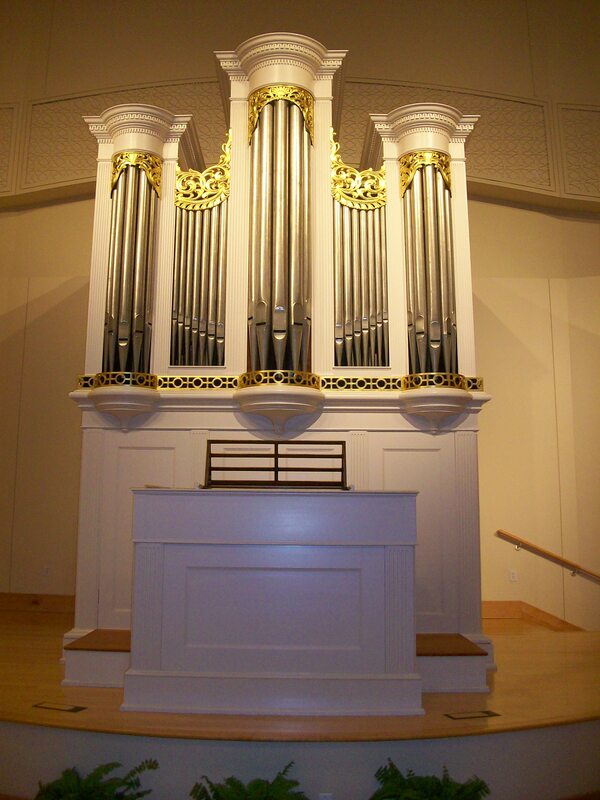 The Tannenberg organ (see top two photos) was completed in 1800 for Home Moravian Church, and its historical importance was recognized when it was dismantled in 1910. In storage for 88 years, it was restored with meticulous care and understanding by Taylor & Boody. 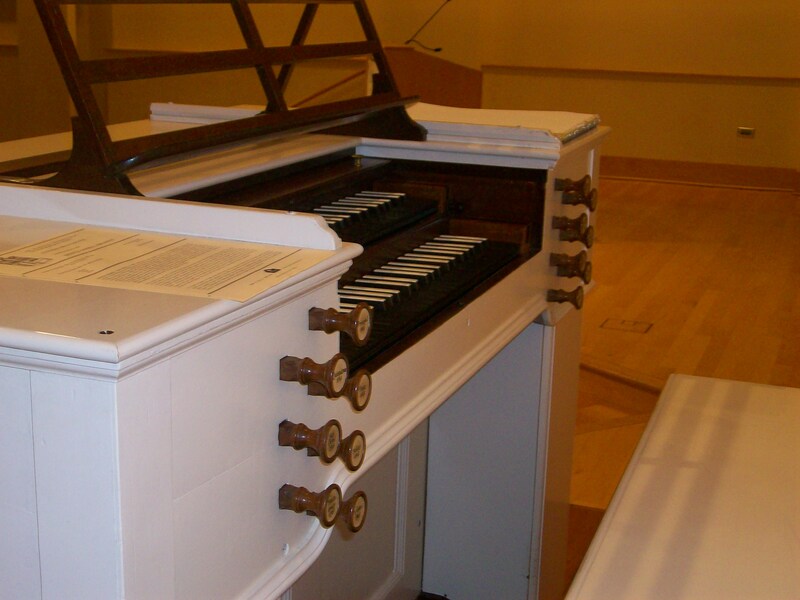 The tracker organs built today by Taylor & Boody are in the same Germanic tradition and of the highest craftsmanship. 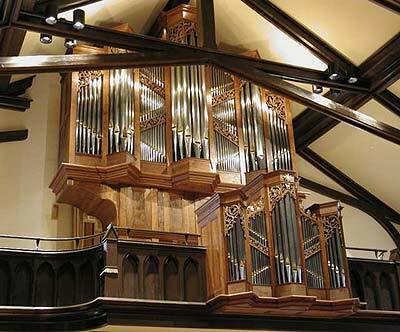 They have organs all over the world, including a magnificent instrument at St. Thomas Church Fifth Avenue in New York City. My years in Staunton were a great time in my musical life, as I sang in a group with John that was led by George’s wife Carol and soaked up the terrific musical experiences of this talented group of musicians and craftsmen. And today’s concert reminded me of that time and of our family’s wonderful connection with another Taylor & Boody organ. Our parish in Staunton had ordered a Taylor & Boody organ as part of a major restoration of the historic church building. At about the same time, we told John Boody that we had to remove three very large walnut trees from our side yard in Staunton, and we would be glad to donate the wood for the organ. John stopped by, loved the look of the wood, and came to supervise the cutting. After curing at the Taylor & Boody sawmill, our trees were incorporated into the beautiful Opus 34 installed in 2000 at Trinity Episcopal Church in Staunton, Virginia. When we return to Trinity, we always stop by the choir loft to say hello to our old friends, the walnut trees. Take a walk through the Taylor & Boody website and see some of the most beautifully crafted instruments in the world. If you’re in Old Salem, visit the Tannenberg organ and think about the beauty of things that last. If you stop by Trinity Church in Staunton, say hello to our old trees.